There are villages which are larger and there may be towns which are smaller. A simple rule of thumb is this; towns have market places but villages have greens. This is too crude a rule and a better way is to look at the shape of the settlement. Villages have grown up higgledy-piggledy round a church and a manor house. Towns like Northleach, Stow-on-the-Wold, Burford and Lechlade were laid out as towns in about 1200 AD and it is noticeable that the town is on one side of the Church. Here for example the town was built to the east and north of the Church. To the south of the Church was a pre-Norman hamlet with two mills and this hamlet was incorporated into the town by the 14th century. The Church, however, remained outside the town. The Abbey of Gloucester owned the land round here from about 780 AD and they decided to build a town here shaped like a “Y” lying on its side. Eighty burgage plots were laid out on the outside of the “Y” and the market place was in the fork of the “Y”. The town was built on the north of the Lecce – or Leece- a Saxon name for stream; and so it was called Northleach. These plots each had a frontage of two rods and went back for twenty rods (about 10 by 100 metres). The ‘generous’ back gardens were to give each family the opportunity to support itself, growing food and keeping animals. There are still ‘cow passages’ from the front door to the rear of the house in many of the properties around the market place today. 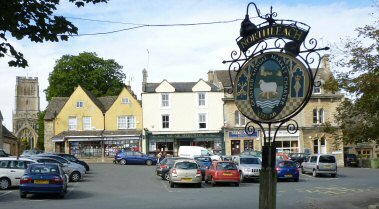 A boom period for Northleach came in 1340 – 1540, when top quality wool from the local Cotswold Lion sheep was exported to Europe. The export of wool to the continent was a prime source of income for the Crown. 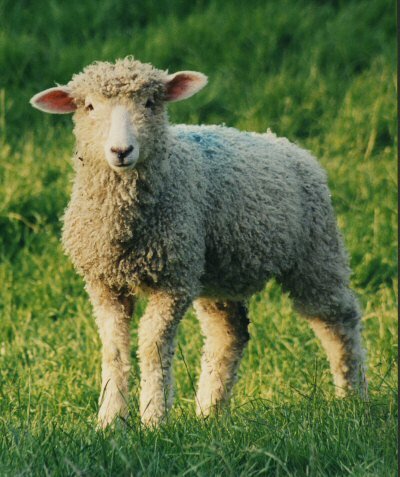 Cotswold wool was famous for its fine quality, and the wool merchants of the Cotswold market towns collected fleeces from the local farms and sold them to middlemen called wool staplers. These merchants of the staple held a monopoly from the Crown, and wool could only be exported by them. In return they collected the income tax on the wool and the importance of the trade was recognized by having the Lord Chancellor sit on the woolpack at Westminster. The woolmen of Northleach were William Midwinter, Thomas and John Fortey, and John Tayler. Wool merchants had become some of the wealthiest men in the country, and fortunately those involved in the trade locally poured much of this money back into the town. They restored the parish church of St Peter and St Paul to such a magnificent state that it became known unofficially as the ‘Cathedral of the Cotswolds’. It is a very fine example of the region’s perpendicular style, and contains a wealth of features, including a handsome porch, regarded by many as one of the best in the country. Brasses in the church remain as a lasting tribute to the generosity of these medieval wool merchants. Most booms are followed by bust, and the change in the fortunes of Northleach was so pronounced from the 16th century onwards, that it never regained its importance in the region. Even until early this century it was almost more famous for its decline than its past glories; which led to it having a very ‘bad press’ until quite recently. So what happened? Even during the fifteenth century, wars on the continent were interrupting the flow of the wool across Europe, and causing a slow-down in trade. During the sixteenth century, when the emphasis of the economy was shifting from agricultural to manufactured goods; the export of raw fleeces was banned altogether by an Act of Parliament. However, wool merchants soon began to realize that exporting manufactured cloth was going to be even more profitable than the export of raw wool, leading to an altogether new trade. Good news for Northleach? No. The river Leach had a mill, but not enough power in the stream or volume to drive a commercial manufacturing industry. So the trade moved to the hillier south of the Cotswolds where the deeper valleys around Stroud produced faster supplies of water in their rivers. In the eighteenth century, however, passing trade picked up as the town was a convenient coaching stop en route from London to Gloucester, and provided a welcome beer and a change of horses for the weary traveller. A number of old coaching inns still stand in the town to this day; the Sherborne Arms; the Red Lion; the Wheatsheaf are all still public houses. Others such as the Old Kings Head, Tudor House and the Union Hotel have seen a change of use over the years. Around 1790, a prison was built to the west of the town by Sir George Onesipherous Paul. It was a great advance on the prisons of the time and became a pattern for others both here and in the USA. (Latterly, in the twentieth century the building was to house a Museum of Rural Life and a remarkable and historic collection of agricultural machinery). The coming of the railways in Victorian times was to supersede the coaching trade; but the railways never came to Northleach, and again the town was left behind. The beginning of the twentieth century was a low point in the status of Northleach. It is said that grass grew down the middle of the High Street, and indeed many of the properties were vacant, and in a state of disrepair. In the decade up to the second world war the town had the lowest building rate in the county. A survey during the nineteen forties revealed that 17% of all properties were regarded as obsolete, and 162 houses were vacant. 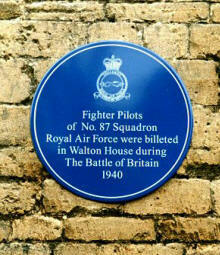 In 1940 during the Battle of Britain No.87 Squadron pilots were billeted in Walton House, a large old coaching inn on the High Street of Northleach. From July to November 1940 they flew Hurricanes from a landing strip situated between Northleach and Bibury, the ground crews being housed in tents there. Amongst the pilots were some famous names like Ian “Widge” Gleed, Roland Beamont, Derek Ward, Dennis David, Roddy Rayner and Laurence Thoroughgood. Flight leader Ian Gleed wrote the Battle of Britain book ‘Arise to Conquer’ and was awarded the Distinguished Flying Cross. The most famous pilot to be stationed at Northleach was Roland Beamont, who went on to destroy 32 flying bombs in 1944, and after the war became a record-breaking chief test pilot, making the maiden flights of the Canberra Bomber, P1, the Lightening and the TSR2, before becoming a director of British Aerospace. In January 2005 Northleach resident Gerald Green arranged for a blue plaque to be unveiled at Walton House, this being carried out by the Lord Lieutenant of Gloucestershire, Mr Henry Elwes, accompanied by S/Ldr Stephen Foster-Bazim and other officers from RAF Brize Norton. The rise of the motor car in the second half of the twentieth century was to bring passing trade back to Northleach, and a revival in the fortunes of the shops and services in the Market Place. It was becoming a ‘coaching stop’ once again! All was improving until problems that arose from the growth in heavy goods traffic on the main A40 from London to the West; which of course was still running through the centre of Northleach in the nineteen-sixties and seventies. The narrowing down of the High Street at either end of the Market Place, along with parked cars along the way was creating an increasingly intolerable situation. More than one tragic road accident in the town finally resulted in the building of a bypass which was opened in 1984. A blessed relief for some; it was hard on the traders who had relied on the flow of traffic through the town for their passing trade. Many shops and pubs changed hands, and the Market Place struggled to find a new identity. Perhaps the most significant result of Northleach being by-passed was that land either side of the High Street was released for the building of new houses. Practically nothing had been built since the construction of the Walton Estate in the nineteen-fifties; the law had prevented new estates from filtering on to a trunk road. With the fair wind of a housing boom behind them, new estates blossomed around the perimeter of the town; eventually pushing hard against its boundaries. Over the following ten years, Northleach was to grow in size by half as much again. Sadly, one of the losses of the 1980’s was the Westwoods Grammar School, which had been built in 1930 on the eastern edge of the town. There had been a Grammar School in Northleach since 1557. The cottage hospital was closed down at the same time despite great local opposition. The shops and services now serve a thriving local community. Northleach, so often the ‘forgotten town of the Cotswolds’, will never be a bustling tourist trap like Bourton-on-the-Water or Stow-on-the-Wold; but it has become a desirable place to live, and as a quiet little town with so many fine features, many visitors regard it as ‘one of the best kept secrets of the Cotswolds’. King Henry III granted the town a charter in 1227 allowing a weekly market to be held, and also an annual fair to be staged on the vigil of the feast and the morrow of St Peter and St Paul. To this day the Charter Fair is still an annual event in the town’s calendar, being held on the last Saturday in June, that being the closest weekend to the feast day of St Peter, on the 29th of June. Its officials (appointed to taste the quality of the beer and its foodstuffs!) are still appointed at the annual ceremony of the Court Leet, in November. This occasion celebrates the origins of local democracy in our land, and each year a new High Bailiff is still elected (now on honorary position) by a jury of local men, as he would have been in the Middle Ages. The annual Court Leet is a very special occasion in Northleach, as it is one of only a handful of Leets in the country that have an unbroken record of meeting through the centuries, to this day. A lively Charter Market is held every Wednesday in Northleach from 8.30am to 2.30pm.